Popular cloud accounting company Xero is among the latest firms to be brandjacked. Cybercriminals are sending hoax invoice notifications purporting to be from the company to users. 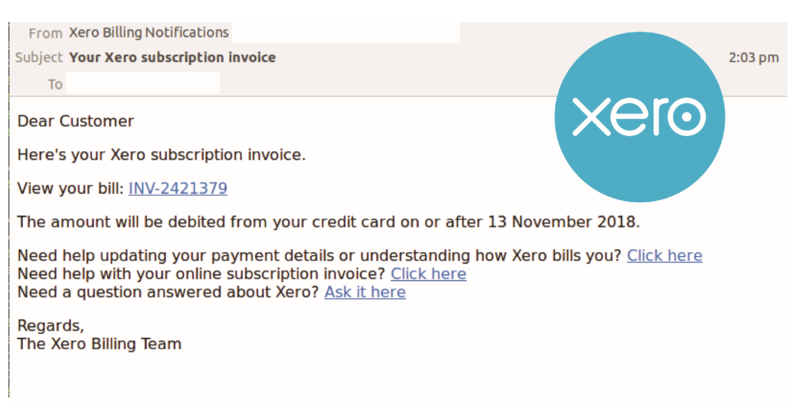 Using the display name ‘Xero Billing Notifications’, the emails hit inboxes on Tuesday AEST. The body of the email is simple, advising recipients that their Xero invoice is ready, and that the amount in the invoice will be debited from their credit card. The fraudulent email actually comes from a large number of compromised email accounts. The email includes several links leading to legitimate Xero help pages. A link to the bill is also provided, containing an invoice number (for example: INV- 2421379 as in the below screenshot). This link is malicious. MailGuard suspects that recipients who click on the link containing the invoice number are led to a blank page which serves up a malicious file download in some cases.